Random Observation/Comment #217: Lately, I’ve been going through a weird phase. It seems I did a full year (2008 Japan trip – Almost end of 2009 Europe Trip) as a frequent blogger and social network user (yes, I realize the addiction). I tried exposing myself to an invisible audience to try something new, and in the process, found one of my all-time favorite hobbies. The RSI and Ulnar tunnel syndrome in my wrists are not the biggest fans of my constant typing, but I absolutely love writing down my ideas and organizing my thoughts. This is why I have been writing a book. It needs a lot of work, but I had a lot of fun reflecting on the story. I guess it was just a part of my to-do list that I needed to get out of the way. I will finish polishing it during my last trip in November before I start work. I must have missed a phase of self-identity in my youth. When I looked in my childhood room, I didn’t see anything particularly reminiscing. It was clean with some scattered memories, but the walls were unfurnished and my hobbies apparently only involved video games and Legos. I think I tried to make it look like a futuristic child’s bedroom with a messy shelf and unkempt bed. I lived in Manhattan for 4 years where my apartment became a personal lair with a limited amount of space to keep organized. The time I spent in Japan and Germany also involved a nomadic space that I temporarily furnished – there was no reason to bedazzle it when I would eventually need to take it down, right? When I returned to that childhood room, however, it suddenly struck me: This is my own personal spot now and I can make it mine with hopes that it will never change. Shouldn’t I feel a rush of relief and happiness when I see my old room when I visit again a few years down the road? I’ve always expected a momentary rush of memories like they do in those movies and video games. To better represent my space, I hung up old posters on my walls filled with trophies and random collections. Memories from my trips were strewn throughout countertops to remind me of good times. For some reason I rehearsed what I would tell someone if they ever entered my room and asked about certain objects. I was fascinated by how much I could remember just by touching their surfaces. It was as if I had one of those super powers from Heroes. After fixing the desk, I looked in my wardrobe and tore everything out. 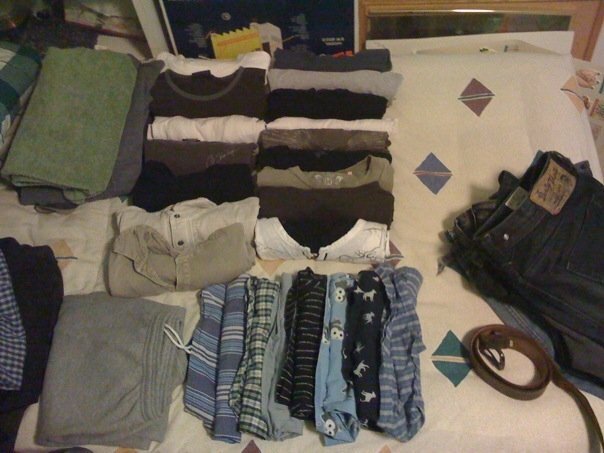 I refolded my clothes and laid them cleanly on my brother’s bed as if it were my only little fashion store. The clothes in season were all laid in plain sight and the shrine for my jeans was perfection. The colors matched nicely and the outfit permutations just raced through my mind. I was satisfied and at peace. From there, I looked at my desktop PC and laptop. Even virtually, there was a mess of unorganized folders and downloads scattered on my main screen. It took some time, but I redeveloped my naming conventions and optimized the depth of the folder tree with the number of children each folder possessed (data structure lingo). Basically, at any given time, I want to be able to reach my file without going through too many folders, but being able to narrow down the file at a quick glance. This would involve categories (as Windows makes with Pictures, Music, Video, and Documents), but to another level (which is the basic purpose of cascading folders). When I was satisfied with document organization, I cleaned every program I never used and optimized everything I could think of. I even reorganized my bookmarks, which had grown absolutely abhorrent in the past year. Cascading folders once again filled the bookmarks and I synced it with Google (since I was using Chrome, it just saves in your Google Docs account). Next, I reviewed the main websites I visited every day. I used the RSS feed option to fill my Google Reader and made lists on my twitter to narrow down my desired content. Instead of going to each webpage to see if updates were there, the updates came to me in one nice package. These subscriptions increased my efficiencies and I don’t even need to go through the bookmarks anymore. Streaming videos would queue in my “things to watch” list and website articles would fill the reader. As time passed, however, I found that it was impossible to read everything. It was then that I trimmed the fat and removed redundancies. Do I really need 5 social networking sites? Do I really need 10 different websites for tech updates? Can I really watch all of the Hulu shows? No one has enough time to just surf without specifically learning any skill set. I wasn’t exactly reading the news to see how it affected market trends, nor did I read up on specific programming languages or contribute to open source projects. I basically just looked at things that I thought was cool so I could perhaps bring it up in normal conversation – so maybe I’d have something to post as a status update, shared link, or tweet. It occurred to me that I had become a consumer of content instead of a producer. I sat there in front of my laptop just absorbing random interesting facts about the world (while staying entertained), but never really giving back to any community. I wrote when it followed my daily schedule, but it was the selfish autobiographical nonsense and a ploy to cross off another line in my to-do list. Even my pictures seemed to have fallen short when I had returned, which made me a little depressed. I felt like I had organized my life, yet it was all done in a selfish manner. I can always increase my efficiencies, but what good is that if I don’t use my extra time for an honorable purpose? I felt that same golden arrow of consumerism I see in our economy. Instead of trading money for materialistic things, we’re just trading time for random knowledge. I must admit that if the majority content consumer did not exist, then there would be no use for the knowledge contributors. Another supply and demand principle, yet I can’t help but think that this content is a different monster – it has many more dimensions of creativity and I believe that everyone can contribute in their own way. It’s not so much that I have been procrastinating my work (although it is definitely a result) – I think I’ve just been distracted by the overwhelming amount of interesting work that others are producing. It is this realization, however, that I find myself reborn (so to speak). I am more feverishly motivated to lay down my ground works while I still have the free time. If I ever want to complete my long list of goals, which I will revamp and list in my next entry, I need to plan accordingly. Reevaluation of goals – I hope others can follow suite; maybe not to publish to the world, but just to keep their compass pointing in the right direction.